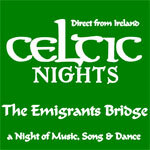 The Pullo Center welcomes Celtic Nights - The Emigrants Bridge to its stage March 17, at 7:30 p.m. Ticket prices are $50 and $38, and are on sale now. Tickets can be purchased at The Pullo Center Box Office, charged by phone at 717-505-8900, or online. From the creators of Gaelforce Dance, the "unmissable two hour spectacular (that) has brought audiences to their feet all around the world" (The Guardian, England) comes a brand new show in celebration of song. Celtic Nights expertly weaves together the lilting melodies and plaintive lyrics of the rich Celtic heritage to tell the story of a people. In this stirring tale of the Celtic experience, the audience is invited to travel along on a journey of hope and promise. You will be transported in time through traditional ballads, vivid choreography and the story of people struggling to find their place in a changing world. Celtic Nights is a unique show which features both the finest male and the finest female voices of the Celtic world, showcased against a thundering backdrop of expert dancing and musicianship. In this glittering production, six of the Celtic world’s most prominent vocal talents are complimented by six of its most accomplished step dancers. This creates an exhilarating picture of proud Celtic people who dared to dream big, and doggedly carved out a home in the New World. In Celtic Nights, their story is told, through the power and majesty of music and the hypnotic fury of dancing feet.